Ever since I made those amazing funfetti sugar cookies, I haven't been able to stop thinking about them! The texture is just fantastic, and the cookies have the best sugar cookie flavor. I decided the only remedy was to make another version of them. 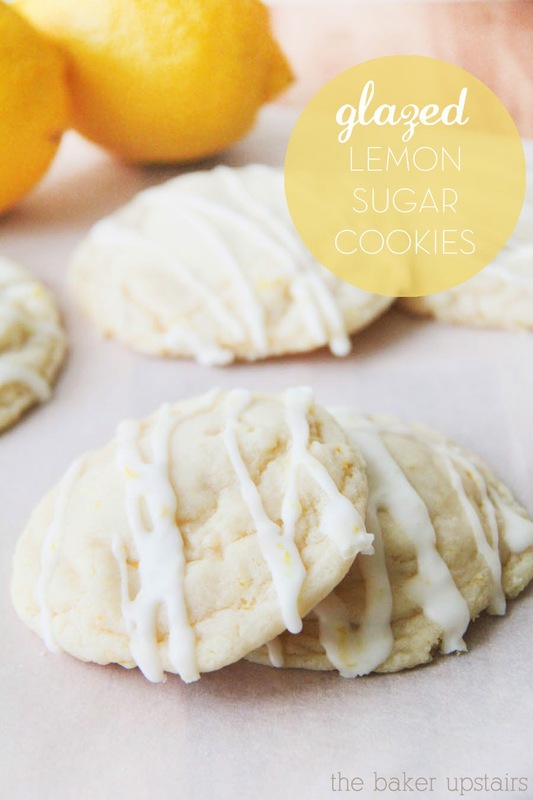 I was chatting with a co-worker about the general awesomeness of lemon desserts, and the idea for these cookies was born. They still have the awesome texture and sweetness of the original cookies, but with some delicious tartness added in as well. My family loved these cookies and couldn't get enough! Preheat oven to 350. Line a baking sheet with parchment or a silicone baking mat. In a large bowl or the bowl of a stand mixer, cream together butter and sugar until light and fluffy. Beat in egg, vanilla, and lemon extract until well blended. Add flour, salt, baking powder, baking soda, cream of tartar, and lemon zest, and mix until a dough forms. Shape into 12 equal sized balls. If your dough is fairly soft, I would recommend chilling it at this point for about 30 minutes. If your dough is thick (like mine was), bake in the preheated oven for exactly 8 minutes. Remove and let cool 5-10 minutes on the baking sheet before removing to a cooling rack to cool completely. While the cookies are cooling, whisk together the glaze ingredients, adding more or less powdered sugar as needed to make a smooth but not runny glaze. Pour the glaze into a plastic bag or piping back, snip a small piece off the corner of the bag, and drizzle over the cookies. Let harden and enjoy! Alicia, I love this photo -- it just jumped off the page (on Pinterest) at me! PS How do you make the little title "thingies" you use? Thanks Jean! I use Photoshop to make the titles and design them all myself. (I know that's probably not helpful to anyone who doesn't own Photoshop.) I've heard really great things about PicMonkey, though, and I think they have a lot of designs built in (circles, banners, dotted lines, etc.) that are similar to ones that I make and use. Thanks for this recipe! Can I make it without Cream of TarTar? I'm not really sure what that is.. I haven't tried them without cream of tartar, so I couldn't say for sure. You can find it next to the spices at the grocery store. I don't know a lot about what it does chemically, except that it helps make the cookies light and fluffy. Can this recipe be doubled? I need them for a family event and a dozen will not be enough. Thanks! I haven't tried it yet but it seems like it would work!